BCDB Rating: 4/5 Stars from 21 users. This page has been viewed 93 times this month, and 15285 times total. Cartoon Characters: Jim Hawkins, John Silver, Billy Bones, Dr. Doppler, Captain "Kitty" Amelia, B.E.N., Blind Pew, Tom Morgan, Black Dog, George Merry, Flint, Scroop, Mr. Arrow, Morph, Sarah, Onus, Hands. Vocal Talent: Joseph Gordon-Levitt (Jim Hawkins), Johnny Rzeznik (Jim Hawkins, singing), Austin Majors (Young Jim Hawkins), Brian Murray (John Silver), Emma Thompson (Captain Amelia), David Hyde Pierce (Doctor Doppler), Martin Short (B.E.N. ), Dane A. Davis (Morph), Michael Wincott (Scroop), Roscoe Lee Browne (Mr. Arrow), Laurie Metcalf (Sarah), Patrick McGoohan (Billy Bones), Corey Burton (Onus), Michael McShane (Hands), Tony Jay (Narrator), Jack Angel, Bob Bergen, Rodger Bumpass, Jane Carr, John Cygan, Jennifer Darling, Paul Eiding, Sherry Lynn, Mona Marshall, Mickie McGowan, Patrick Pinney, Phil Proctor, Jeremy Suarez, Jim Ward, Kevin Zegers. Associate Producer: Peter Del Vecho. 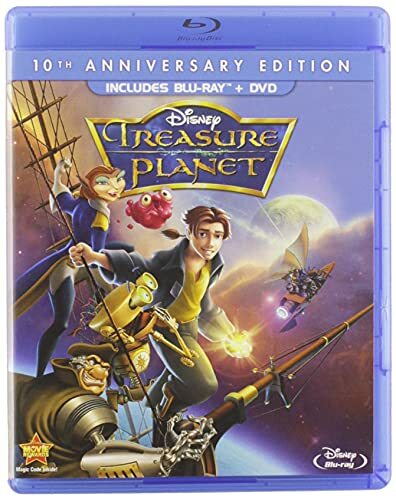 Animated By Glen Keane (John Silver), John Ripa (Jim Hawkins), Ken Duncan (Kitty, Scroop), Sergio Pablos (Dr. Doppler), T. Dan Hofstedt (Mr. Arrow), Nancy Beiman (Billy Bones), Jared Beckstrand (Jim Hawkins's mother), Michael Show (Morph), Oskar Urretabizkaia (B.E.N), John Pomeroy (Flint) (Supervising Animators). Character Animators: John Ripa (Jim Hawkins), Adam Dykstra (RLS Legacy crew), Ellen Woodbury (RLS Legacy crew), Brian Ferguson (Character Animator, RLS Legacy Crewman), Marc Smith (Hands). Written By Ron Clements, John Musker. Screenplay: Ron Clements, John Musker, Rob Edwards. Animation Story: Ron Clements, John Musker, Ted Elliot, Terry Rossio. Adapted from the novel "Treasure Island" By: Robert Louis Stevenson. Music By James Newton Howard (Score). Associate Editor: William J. Caparella. First Assistant Editors: James Dewey Kirkpatrick, Evan Fisher. Assistant Editor: Mary Margaret Blee. Associate Art Director: Ian Gooding. Artistic Supervisor, Story: Barry Johnson. Artistic Supervisor, Layout: Rasoul Azadani. Artistic Supervisor, Background: Dan Cooper. Artistic Supervisor, Clean-Up: Vera Pacheco. Artistic Supervisor, Visual Effects: Dave Tidgwell. Artistic Supervisor, Computer Graphics Imagery: Kyle Odermatt. Assistant Artistic Coordinator: Tina Price. CAPS Supervisor, Scene Planning: Thomas Baker. CAPS Supervisor, Animation Check: Barbara Wiles. CAPS Supervisor, 2D Animation Processing: Robyn L. Roberts. CAPS Supervisor, Color Models: Karen Comella. CAPS Supervisor, Paint/Final Check: Hortensia M. Casagran. CAPS Supervisor, Compositing/Digital File Services: James "Jr" Russell. CAPS Supervisors, Digital Film Print: Brandy Hill, Christopher W. Gee. Production Design: Steven Olds, Frank Nissen. Visual Development & Character Design: Peter Clarke, Peter De Sñve, Craig Elliott, Thierry Fournier, Buck Lewis, Rick Maki, Alex Nino, Eric Pigors, Michael Spooner, Rowland Wilson. Clean-Up Line Stylist: Emily Jiuliano. Story Artists: Francis Glebas, Kirk Hanson, Ken Harsha, Kaan Kalyon, Mark Kennedy, Sam Levine, Alex Mann, Frank Nissen. Story Trainees: Donnie Long, Woody Woodman. Layout Journeymen: Daniel Hu, Jeff Beazley, David Krentz, Emil Mitev, Rick Moore, Kevin Ichan Nelson, Doug Walker. 3D Lighting Supervisor: Kenneth Brain. Key Assistants: Thomas Debitus, Craig Elliott, Lam Hoang, Michael Bond O'Mara, Gang Peng, Donald Reich, Nathan Detroit Warner, Chung Sup Yoon. Assistants: Shawn Colbeck, Mina Ho Ferrante, Brian Kesinger, Julio Leon, Peter Maynez, Jonathan Pyun. Blue Sketch: Madlyn Zusmer O'Neill, Bill Davis, Monica Albracht Marroquin. Model Development TDs: William Otsuka, Christopher Poplin. Scene Set-Up: Amy Lawson Smeed, Brian Smith. Animators: James Baker, Michael Cedeno, Jerry Yu Ching, Danny Galieote, Randy Haycock, Shawn Keller, Sang-Jim Kim, Doug Krohn, Mario J. Menjivar, Bobby Alcid Rubio, Michael Stocker, Oliver Thomas, Bill Waldman, Dean Wellins, Dougg Williams, Anthony Wong. Clean-Up Lead Key: Dan Tanaka. Associate Lead Key: Margie Daniels. Key Assistants: Inna Chon, Marcia Kimura Dougherty, Lee Dunkman, Carl Philip Hall, Susan Lantz, Elizabeth S. Watasin. Assistants: Kevin M. Grow, Dietz Toshio Ichishita, Daniel Yoontaek Liman, Nette Morel, Wendy J. Muir, Mary-Jean Repchuk. Breakdown: Patricia Ann Billings, Nickolas M. Frangos. Inbetweeners: James Burks, Thomas Estrada, Flora Sung Sook Park, Suzanne Hirota Burks. CGI Lead Animator: Eric Daniels. Animators: Anthony De Rosa, Tom Gately, Richard Hoppe, Chris Hubbard, Ron Husband, Bert Klein, Marc Smith. CGI Animator: Rebecca Wilson Bresee. Assistant CGI Animators: Darrell Johnson, Thanh John Nguyen. Scene Set-Up: L. Rhiannon Leffanta. Key Assistants: Scott Anderson, Jesus Cortesgail Frank, Karen A. Hardenbergh, Calvin Le Duceric Pigors. Breakdown: Christenson M. Casugoai, Dan Flynn, Gary J. Myers, Hugo Soriano. Inbetweeners: Kari Pearson Lancaster, James Anthony Marquez. Rough Inbetweener: Raul Aguirre (uncredited). Supervising Animator: Ken Stuart Duncan. Animators, Captain Amelia: Mark Alan Mitchell, Joe Oh. Key Assistants: Sean Gallimore, Steve Lubin. Animators: Dale Baer, David Block, Robert Espanto Domingo, David Moses Pimentel, Nik Ranieri, Andrea Simonti. Lead Key: Juliet Duncan, Tracy Mark Lee. Key Assistants: Akemi Gutierrez, Trevor Tamboline. Inbetweeners: Drew Adams, Daniel Schier, Kimberly Moriki Zamlich, Taik Lee. Animators: Mark Anthony Austin, Doug Bennett. Assistant Animators: Chris Edwards, William Campbell. Scene Set-Up: David W. Thompson. CG Lead Key: Kathleen M. Bailey. Look Development Assistant TDs: ñilvinas Lilas, Scott Mankey, Ruth Ramos, Christopher James Miller (Trainee). Scene Set-Up: Timothy J. Bergeron. Key Assistant: Michael G. McKinney. Assistants: Diana Coco, Yoon Sook Nam. Key Assistants: Sue Adnopoz, Tony Anselmo, Jamie Kezlarian Bolio, Merry Kanawyer Clingen, Yung Soo Kim, Dana M. Reemes. Assistants: Daniel Bowman, Ray Harris, Rick Kohlschmidt, Peggy Tonkonogy. Supervising Animator: T. Daniel Hofstedt. Lead Key: Kathleen M. Bailey. Assistant: Chun Yin Joey So. Breakdown: Jody Kooistra, Cathie Karas Wilke. Supervising Animators: Adam Dykstra, Ellen Woodbury. Animators: Mike Disa, Larry White. Lead Keys: Debra Armstrong Holmes, Terry Naughton, Alex Topete. Assistants: Cynthia Jill French, Janet Heerhan Kwonle, Ticia Lichtwardt, Brian Mainolfi, Bernadette Moley, Marty Schwartz, Steven K. Thompson. Breakdown: Cliff Freitas, Jim Snider. Visual Effects Animators: Sean Applegate, Dan Chaik, Aian J. Coony, Peter De Mund, Colbert Fennelly, James Menehune Goss, Bruce Heller, Craig L. Hoffman, Michael Cadwallader Jones, Bill Konersman, Kevin Leebrian Lutge, James DeValera Mansfield, Mark Myer, Masa Oshiro, Kee Nam Suong, Phillip Vigil. Effects Key Assistants: Marko Barrowsty Elliott, Geoffrey C. Everts, Ray Hofstedt, Elizabeth Holmes, David M. Kcenich, Peter Francis Pepe Jr., Amanda J. Talbot, John Tucker. Effects Assistants: Kimberly Burk, Lisa A. Reinert. Effects Breakdown: Jay Baker, Kristin K. Fong Lukavsky, Ron Pence, Philip Pignotti, Jeffrey C. Plamenigme, Linda Wang. Model Development TD: Raj S. Naiksatam. Look Development TDs/Lighting Artists: Stephen V. Hwan, Mohit Kallianpur. Production Software TD (Efx): Jeffrey Edwards. Scene Set-Up: Claire Lawrence-Slater, Jeff J. Marshall, Jason G. Salata. Rough Inbetweeners: Raul Aguirre, Jr., Noreen Beasley, George Benavides, Neal Stanley Goldstein, Benjamin Gonzalez, Mike Greenholt, Grant Hiestand, Ely Lester, Bob Persichetti, Aliki Theofilopoulos, Kathleen Thorson. Model Development TD: Gregg Lukomski. Digital Production Manager, Digital Production: Craig A. Sost. Model Development Supervisor: Gil Zimmerman. Look Dev/Lighting Supervisor (Efx/Char): Umakanth Thumrugoti. Software Development Supervisor (BG): George Katanics. Production Software/Look Dev TD: Chris Springfield, Phd. Production Pipeline Supervisor: Mary Jane "M.J." Turner. Model & Motion TD (Anim): Carlos Cabral. Backgrounds: Jennifer K. Ando, Doug Ball, Hye Young Coh, Scott Fassett, Jean-Paul Fernandez, Thierry Fournier, Nathan Hughes, Carl Jones, Lisa Keene Robledo, John Lee, Jerry Loveland, James J. Martin, Kelly McGraw, Gregory C. Miller, Daniel Read, Leonard Robledo, Christophe Vacher. Digital Re-Touch Painter: Nancy Olivñt Ramirez. Lighting Artist & Texture Map Painter: Sean Eckols. Look Development TDs: Clunie Holtni, Coletta Marcialis, Mark A. Wilson. Scene Set-Up: Mary Therese Corgan, Ron Williams. AVID Assistant Editors: Paul Chandler Carrera, David Teller. Animation Editors: James Melton, Hermann Hans Schmidt. Casting: Ruth Lambert, C.S.A., Mary Hidalgo. Casting Associate: Matthew Jon Beck. Story And Publicity: Angela Lepito. Layout: Bill Bloom, Paul Lanum. Animation: Diana Blazer, Stacey Ernst-Campbell. Visual Effects: Seth C. Walsh. Sweatbox/Electronic Workbook: Joe Crowley, Todd J. Winton. Manager Color Models: Holly E. Bratton. Manager Disk Space & Retakes: Brenda McGirl. Assistant Manager Scene Planning: Katherine A. Irwin. Assistant Production Manager Animation Check: Cathy Leahy. Assistant Production Manager Color Models: Daniela Mazzucato, Julie Vieillemaringe. Assistant Managerdisk Space And Retakes: Ben Lemon. Assistant Manager Camera: Stephanie C. Herrman. Show Lead: Mark A. Henley. Scene Planners: S.J. Bleick, Annamarie Costa, Glen Claybrook, Eric Gervais-Despres, Cynthia Goode, Ronald J. Jackson, Faye Tipton Johnson, David J. Link, Scott McCartor. Scene Planning & EFX Data Entry: Monica Dollison, Laura L. Jaime, Sherri H. Villarete. Assistant Supervisor: Karen S. Paat. Animation Checkers: Nicolette Bonnell, Janette Hulett, Denise M. Mitchell, Helen O'Flynn, Kathleen O'Mara-Svetlik, Gary G. Shafer, Mavis Shafer, Karen Somerville. Assistant Supervisors: Karen N. China, Gareth P. Fishbaugh. Digital Mark-Up: Lynnette E. Cullen. 2D Animation Processors: David Braden, Jo Ann Breuer, Corey Fredrickson, Robert Lizardo, Michael Alan McFerren, Richard J. McFerren, Stacie K. Reece, David J. Rowe. Color Model Stylists: Fergus J. Hernandez, Debbie Jorgensborg, Sylvia I. Sanchez, Marie St. Clair, Judith L. Tolley. Assistant Supervisors: Irma Velez, Russell Blandino, Phyllis Estelle Fields. Color Model Mark-Up: Bill Andres, Sherrie Cuzzort, Beth Ann McCoy-Gee, Grace H. Shirado, David J. Zywicki. Registration: Karan Lee-Storr, Leyla C. Amaro Nodas. Paint Mark-Up: Carmen Regina Alvarez, Roberta Lee Borchardt, Casey Clayton, Patricia L. Gold, Bonnie A. Ramsey, Myrian Ferron Tello. Painters: Carmen Sanderson, Joyce Alexander, Kirk Axtell Ii, Phyllis Bird, Joey Calderon, Janice M. Caston, Florida D'Ambrosio, Robert Dettloff, Michael Foley, Kent Gordon, Debbie Green, Vernette Griffee, Gayle Kanagy, David Karp, Angelika R. Katz, Kukhee Lee, Randall McFerren, Deborah Jane Mooneyham, Margarito Murillo, Ofra Afuta Naylor, David Nimitz, Karen Lynne Nugent, Devon Oddone, Eric Oliver, Dolores Pope, Rosalinde Praamsma, Saskia Raevouri, Yolanda Rearick, Christine Schultz, Heidi Woodward Shellhorn, Fumiko Roche Sommer, S. Ann Sullivan, Roxanne M. Taylor, Tami Terusa, Christina Elaine Toth, Britt-Marie Van Der Nagel, Arthur Zaslawski. Assistant Supervisor: Teri N. McDonald. Final Checkers: Lea Dahlen, Misoon Kim, Sally-Anne King, Catherine Mirkovich-Peterson. Assistant Supervisor Compositing: Timothy B. Gales. Digital File Services: Joseph Pfening. Assistant Supervisor Compositing: Jason Leonard, Robert Buske. Camera/Film Recorder Operators: John D. Aardal, Bill Aylsworth, David Booth, Marc Canas, John Derderian, Bill Fadness, Jennie Kepenek Mouzis. Reuse & Stock Librarian: Vicki L. Casper. "I'm Still Here (Jim's Theme)"
Written And Performed By: John Rzeznik. Mixed By: Tom Lord Alge. "Always Know Where You Are"
"Alasdair Fraser's Compliments To Lorna Mitchell"
Score Produced By: James Newton Howard. Electronic Score Produced By: James T. Hill. Score Conducted By: Pete Anthony. Choir Conducted By: Nick Ingman. Score Recorded And Mixed By: Shawn Murphy. Additional Engineering By: Kira Lewis. Score Orchestrations By: Jeff Atmajian, Brad Dechter, Pete Anthony, Frank Bennett, Jon Kull, James Newton Howard. Auricle Control Systems: Ichard Grant. Supervising Music Editor: Jim Weidman. Music Production Supervisor: Tom MacDougall. Music Production Manager: Andrew Page. Music Production Coordinator: Deniece Hall. Music Production Assistant: Joel Berke. Music Contractor: Sandy De Crescent. Choral Contractor: Isobel Griffiths, Ltd.
Choir Master: Natural Voices, London, England; Jenny O'Grady. Music Preparation: Jo Ann Kane Music Service, Dakota Music Service, Ltd.
Assistant To The Producer: Janet Blazon. Assistant To The Directors: Mae Respicio. Assistant To The Associate Producer: Gabrielle Derouen-Hawkins. CAPS Production Coordinator: Kirsten A. Bulmer. CAPS Administrative Coordinator: Rikki Chobanian. Camera Department Coordinator: Suzy Zeffren-Rauch. Disk Space & Retakes Coordinator: Renato Lattanzi. Production Assistants: Philip M. Cohen, Jamal M. Davis, Cindy Leggett Ford, Penelope Franks, Audrey Ellen Geiger, Jeffry G. Georgianni, Wendell Lawrence Harvey, Nicole P. Hearon, Adam Karpel, Tim Kwan, Nathan Massmann, Allyson Mitchell, Charlene Moncrief, Patrick G. Ramos, Clint G. Reagan, Rudy Cñrdenas Rños, Brian G. Smith, John Trosko, Debbie Vercellino, Lisa Marie Webster, Debbie G. Yu. Additional Visual Development: Kevin Altieri, Nancy Beiman, Andrey Brandl, Marek Buchwald, Matt Codd, Guy Deel, Ricardo Delgado, Don Dougherty, Jean Gillmore, Joe Grant, Dennis Greco, Tom Kidd, John Mahoney, Robh Ruppel, Harald Siepermann, Tamara L. Stocker, John Watkiss. Additional Layout: Rob Cardone, James Finch, Cory Florimonte, Louis Flores, Billy George, Donivan W. Howard, John Puglisi. Additional Effects: Virgilio John Aquino, Michael N. Daugherty, D. Joseph Mildenberger, Jean-Paul Orpinas, Joseph Christopher Pepe, Tonya Ramsey, Van Shirvanian, Steve Starrni, Cole A. Zamora-Redson. Additional Rough Inbetweeners: Casey Coffey, Wendie Lynn Fischer, Larry R. Flores, Edmund Gabriel, Michael Lester, Joseph Mateo, Kevin M. Smith, Chris A.C. Sonnenberg, Wes Sullivan. Additional Backgrounds: Brad Hicksdon Moore. Additional Clean-Up: Todd H. Ammons, Wes Chun, Christopher Gerard Darroca, Frank Dietza, Rturo Alejandro Hernandez, Chang Woo Jung, Cynthia Landeros, Miriam McDonnell, Brian B. McKim, Denise Meehan, Don Parmele, Dorothea Baker Paul, Gary Payne, Allison Renna, Al Salgadom, Yung Kang Teague, Eun Yustephan Zupkas. Additional Production Support: Sylvie Bennett-Fauquñ, David J. Blumenfeld, Floyd Casey, Coralie Cudot-Lissillour, Robert Deladillo, Kim Cope, Fred Herrman, Jason Hintz, Greg Martinarace, Li Pimentel, Michelle Robinson, Alexandra Skinazi, Lisa Suzuki, Ann Tucker, Rafañl Vicente. Additional Production Accountants: Nancy Guo-Gustafsson, Debbie Hagman, Frank William Knittel, Jr., Lisamarie Worley. Manager, Core Animation Software: John A. Palmieri. Manager, Digital Animation Software: Steve Poehlein. Manager, Media Group: Christopher I. Dee. Manager, Management Applications: Kevin John Hussey. Manager, Resource Management: Kristina Reed. Manager, Systems Software Development: Graham S. Allan. Manager, Technical Support: Mark Dawson. Manager, Technical Services: Mark M. Tokunaga. Manager, Traditional Animation Software: Todd Scopio. Senior Manager, Software: John Henry Brooks. Render I/O: Lorenzo Russell Bambino, James Colby Bette, Edward Derian Boyke, David Bush, Christian M. Elsensohn, Michael Guttman, Carl "C.J." Le Page, Jimmie A. Nelson, Jr., Alan A. Patel, Elkeer Zaldumbide Pratt, Nicholas Smaldino, Brad Smith, Kevin Waldvogel. Technology Support: Brett Achorn, Natalie Acosta, Jaysinghe Amindra, Heidi Marie Andersen, Mark L. Barnes, Richard M. Barnes, Dale R. Beck, Glenn C. Bell, Jason L. Bergman, Janet E. Berlin, Cathy E. Blanco, Michael S. Blum, Michael C. Bolds, Rik Bomberger, Stephen D. Bowline, Aileen Brimecombe, Brad Brooks, Letha L. Burchard, Scott L. Burris, Roberto A. Calvo, William T. Carpenter, Steven C. Carpenter, John W. Cejka, Lawrence Chai, Gina Yihjiun Chen, Yan Chen, Kent K. Chiu, Loren Chun, Peter Lee Chun, Michael Clay, Ray C. Coleman, Troy Conrad, Allen Corcorran, Tom Corrigan, Patrick Dalton, Nolan R. Davis, Charles E. Deal, Margaret Ann Decker, Lyly Do, Michael J. Dobson, Elena Driskill, Dave M. Drulias, Brendan K. Duncan, Jerry A. Eisenberg, Norbert Faerstain, Yun-Po Paul Fan, Thomas J. Fico, Megan J. Fish, David Patrick Flynn, Sahara E. Ford-Wernick, Bobby L. Fowler, Jr., Kevin G. J. Freels, Carlos E. Garcia-Sandoval, Scott Garrett, Adam Garza, Jonathan E. Geibel, Ron Gillen, Sean Goldman, Carlos Gonzalez Ochoa Aleman, Marianne Camille Gorczyca, Thomas Greer, Brian Arthur Griffith, Leo Gullano, James Healy, Michael J. Henderson, David R. Hernandez, Paul Hildebrandt, Jay D. Hilliard, B. Scott Himes, John D. Hoffman, Shannon R. Howard, James P. Hurrell, Bill James, Darrian M. James, Michael Lee James, Amindra "AJ" Jayasinghe, Danny Jewell, Jason Phillip Johnson, Marc Jordan, David A. Karl, Kevin E. Keech, Kimberly W. Keech, John Kennedy, Daniel C. Kim, Michael D. Kliewer, Fred Lacayanga, Catherine Lam, Joseph M. Lohmar, John A. Longhini, John Edward Lopez, James Macburney, Jean Mandonet, Michael Martines, Michael A. McClure, Stuart McDougal, Dara McGarry, Kevin A. McGuire, Mark A. McLaughlin, Maryann McLeod, Dayna B. Meltzer, Elizabeth Meyer, Christopher D. Mihaly, Thaddeus P. Miller, Thomas Moore, Jr., Ramon Montoya-Vozmediano, G. Kevin Morgan, Jack Muleady, Jeff Nash, Marlon S. Navarro, Tom Naylor Ii, Greg Neagle, Paul Allen Newell, Troy Norin, David Oguri, Mabel Lim Okamura, David E. Ortega, Jiwon Paik, Tony Palmieri, Tamara R. Payton, Ernest J. Petti, Ron L. Purdy, Julie Reelfs, Allan G. Rempel, Patrick Robin, Brian J. Rodriguez, Kaizhen Ruan, Jeff Sadler, Michael Saitta, Atiq Sajawal, Valerie Sand, Ken Sandberg, James S. Sandweiss, Matthew F. Schnittker, Stephen J. Serra, Arthur Shek, Seung Hee Shin, Jeffrey L. Sickler, Lewis N. Siegel, Buddy W. Smallwood, Geo Snelling, Jason Sogolow, Clay Speicher, Zachary Stokes, Byron Stultz, Zondra Sunseri, Wendy Ming-Yee Tam, Rasmus Tamstorf, Daniel Teece, Scott S. Terek, Bond-Jay Ting, Alexandre Torija-Paris, Laurie Tracy, Tamara Valdes, Carl Villarete, Lewis Wakeland, Doug White, Derek Elliott Wilson, Tomas A. Wong, Terence Worley, Fran R. Zandonella, Michael Zarembski. Post Production Supervisor: Bñrñnice Robinson. Post Production Coordinator: Valerie Anne Flueger. Senior Manager Post Production: Sue Bea Montgomery. Post Production Engineer: Michael Kenji Tomizawa. Re-Recorded At: Buena Vista Sound Studios. Re-Recording Mixers: Terry Porter, Mel Metcalfe, Dean A. Zupancic. Original Dialogue Recordists: Doc Kane, Nick Angell, Vince Caro, Brian Riordan, Jackson Schwartz, Greg Steele. Sound Design & Editing: Danetracks, Inc.
Sound Designer/Supervising Sound Editor: Dane A. Davis, M.P.S.E. Supervising Sound Editor: Julia Evershade, M.P.S.E. Sound Effects Designer/Editor: Richard Adrian. Supervising Foley Editor: Andrew Lackey. First Assistant Sound Editor: Nancy Barker. Assistant Sound Editor: Stephanie Brown. Assistant Sound Designer: Bill R. Dean. Foley By: Warner Bros. Hollywood. Foley Artists: John Roesch, Alyson Moore. Foley Mixer: Mary Jo Lang. Dubbing Recordists: Judy Nord, Jeannette Cremarosa. Additional Dialogue Recordists: John Bateman, Mike Boudry, Dan Cubert, Tom Maydeck, Robert Townsend. Negative Cutters: Rick Mackay, Mary Beth Smith. Title Design By: Brian King. End Titles By: Buena Vista Imaging. Projection: Don Henry, Ken Moore, Deem Rahall, Christine Anne Sparkes. Telecine Operators: Robert H. Bagley, Robert J. Hansen. Produced And Distributed On: Eastman Film. Copyright © MMII Disney Enterprises, Inc. This Film Is Rated PG For Adventure Action And Peril. Do you have anything to add to this page? 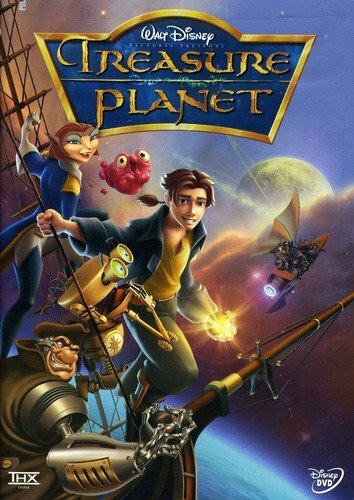 Have we made any mistakes... or do you have any additional information about Treasure Planet? If so, we would love to hear from you. Please send us a quick note with your additions or corrections to this page, and we will make the corrections as soon as possible! A Disney version of Robert Louis Stevenson's "Treasure Island," set in outer space. Below are comments about this cartoon submitted by people who have seen this show. Take a look and see what others have said about Treasure Planet. We want to know what you think, too!! Feel free to share your own opinion- we do want to hear from you! You can add your own comments here. Get ready to buckle up with space shattering secret. A secret of a whole planet filled with the treasures of a million star systems and only one boy named Jim Hawkins was the only map. Treasure Planet by Big Cartoon DataBase is licensed under a Creative Commons Attribution-NonCommercial-ShareAlike 4.0 International License.